“That exotic tribe was us. And the time we have taken, our moment.” 1970, Glenroy. One summer’s morning Rita is awakened by a dream of her husband, only to look out on an empty bed. It’s been years since Vic moved north and left her life, but her house holds memories and part of her remains tied to a different time. As their son Michael enters the tender and challenging realm of first love, he too discovers that innocence can only be sustained for so long. As they prepare to celebrate Glenroy’s 100th anniversary, the residents of the Melbourne suburb look back on a time of radical change. The time has come for them to consider the real meaning of progress – both as a community and in their personal lives.The Time We Have Taken is a powerful and poignant look at the extraordinary that lies within the ordinary, from a writer of breathtaking prose. Steven Carroll was born in Melbourne and grew up in Glenroy. He went to La Trobe University and taught English in high schools before playing in bands in the 1970s. After leaving the music scene he began writing as a playwright and became the theatre critic for The Sunday Age. He has recently given up his lecturing post at RMIT to write full-time and lives in Brunswick, Victoria. His novels The Art of the Engine Driver and The Gift of Speed were both shortlisted for the Miles Franklin Award. 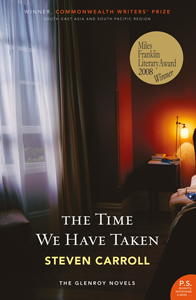 In 2008 The Time We Have Taken won the Commonwealth Writers Prize for Best Book, South-East Asia and South Pacific region as well as the 2008 Miles Franklin Award, Australia’s most prestigious literary prize.